Thread type M23. Application Signal. Type of locking Screw locking. Cable seal data. Model P32K3Q. Current 20A. 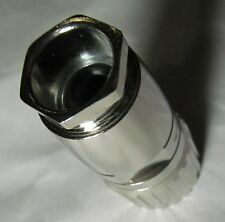 1 x Aviation Connector Supplied. 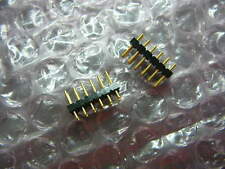 Straight and unshielded type, P series circular connector. Pin Number 12. Total Size 95 x 40 x 40mm/3.7" x 1.6" x 1.6"(L W H). 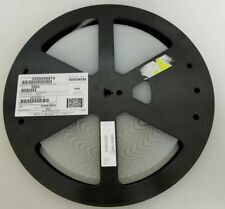 Up for sale is a new reel of 2,500 Molex 0559099974 BTB 12 positon Vert SMD connectors. I have 3 reels for a total of 7,500 pieces. ● Protection Level: IP67. Protection level IP67. Pairing Docking Plug Model Number ● PBT material shell, stable electrical performance, high strength and resistance to pressure, high temperature resistance, anti-explosion, anti-corrosive. 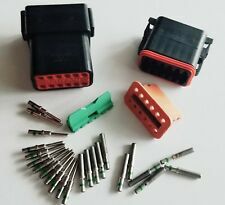 For sale are 10-Piece lots of Molex 39-03-6124 Receptacle Housing with Positive Latch. They are difficult to find in small lots. NEW & ORIGINAL 2 Pieces. 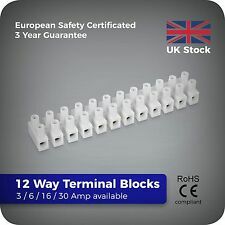 The plug is suitable for use with KFR, KFV, KGR, KGV, KV and WKV sockets. >10GR Insulation resistance. Gender: Plug. Connector Mounting: Cable. ● Protection Level: IP67. Protection level IP67. Pairing Docking Plug Model Number Pairing Socket Model Number ● Socket and internal components zinc alloy material, with a complete electromagnetic and radio frequency interference protection. Manufacturer Series CLH. Body/Shell Style SOCKET. MIL Conformance NO. Rated Current (Signal) 1.5 A. NEW & ORIGINAL 5 Pieces. Number Of Connectors ONE. Number of Rows Loaded 2. Number Of PCB Rows 2. Used for 3, 6 and 10 Amp rated Flex Cable. Maximum Current: 10 Amp. Housing Material: Nylon. Pitch - Mating0.100" (2.54mm). Mounting TypeThrough Hole, Right Angle. Connector TypeReceptacle. Row Spacing - Mating0.100" (2.54mm). Insulation Height0.120" (3.05mm). NEW & ORIGINAL 10 Pieces. 0322 12 Lumberg Din Audio / Video Connector Receptacle 12 Cable Mount Nylon (Polyamide) Body. Product Details. DT06-12SA with E003 mod. 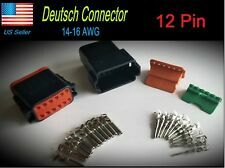 Deutsch 12 pin Plug. Female Cable Connector 12 pole. WILL MATE TO FEMALE OF OTHER MAKES. MIDDLE ROW OF 4 PINS ANY OF THEM CAN BE REMOVED. LOT of 10 - This is a new part. 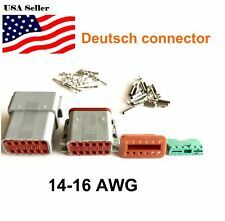 12-way socket housings, Deutsch DT Series #DT06-12SA. WARNING: This product can expose you to chemicals including lead, which is known to the State of California to cause cancer. TWO New Pulse Jack JK0-0036NL. Number of Ports 1. Number of Loaded Positions 12. Product Height (mm) 14.98. Product Depth (mm) 33.02. Product Length (mm) 18.64. Pitch (mm) 2.03. Integrated Magnetics Yes. 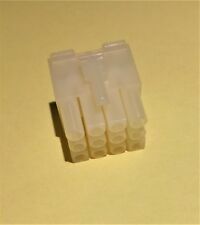 New, sealed (except for the one opened for pictures), 12-pin connector. Sold as is. Buyer pays shipping. Will combine shipping on multiple items. Manufacture: Samtec. Pitch: 0.100” (2.54mm). Number of Positions: 12 Position. Part Number: TSW-106-07-T-D. Number of Rows: 2. Product Range KK 41791 Series. Manufacturer Part No Order Code. Tyco TE Connectivity. 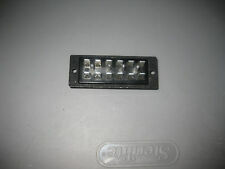 Connector Header. Both plugs have 12 pins including the center pin.